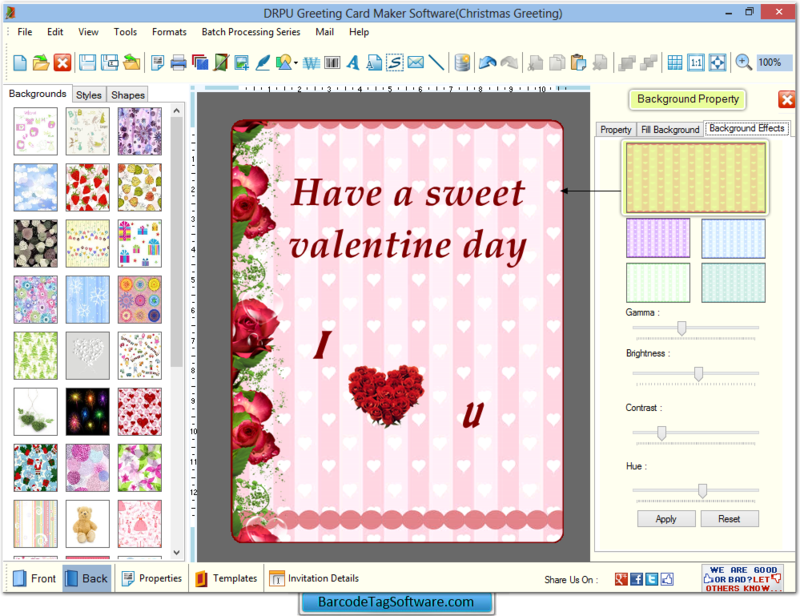 Greeting card maker software designs and creates homemade greeting cards. Software provides advanced card designing view with designing objects like text, pencil, ellipse, rectangle and picture to design greeting cards. Valentine’s Day Greeting Cards etc. Create customize greeting cards in multiple shapes including rectangle, rounded rectangle and ellipse shapes. You can insert various clip arts, border, graphics, text messages, pictures and backgrounds during the time of greeting card creation. Provides advanced card designing view with different card designing objects. Provides different colors, clip arts, backgrounds and pictures to create greeting card. Make new greeting card or edit existing greeting card image. Print colorful greeting cards using advanced print settings.